Whilst there are several changes to the Pumas team the handed Ireland that 22-20 defeat last week their team has remained annoyingly competitive. Not even the considerable loss of Conto seems to be worrying the Argentines. Montpelier out-half Todeschini (pictured) has stepped into the number 10 berth in place of Felipe as the Leinster 10 returns to Dublin this weekend to graduate from the College of Surgeons. If the name Todeschini sounds vaguely familiar it is ptobably because he was the man wearing 10 last Autumn who scored 22 of Argentina's 25 points as the south Americans upset the English in Twickenham. They won't be any kind of pushover. Although it is a 'weakened' Argentine pack, they're clearly just gonna try bully the Irish eight into submission (especially after being embarrassed by the Irish pack last week) and Todeschini sit back and kick the points. Expect a slightly more conservative forwards game from the Argentines under Todeschini, from what I can remember he's not exactly a creative powerhouse with ball in hand. There are a fair few changes to the Irish team that played last week as well. Twelve to be exact. With Paddy Wallace out with injury Jeremy Staunton has been called away from Ireland 'A' duty to fill the void at out-half. 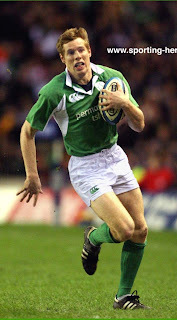 Similarly Rob Kearney wins his first cap filling in for the injured Tommy Bowe (hurray!). An injury to Andrew Trimble also forces Gavin Duffy (pictured) into the centre whilst Geordan Murphy slots in at full-back to take over from Duffy. Eoin Reddan and Barry Murphy are the other two new names in a completely reworked backline. Only Brian Carney remains from the starting backline last week. Hopefully he'll get more ball this week too now that 'crash-ball' Trimble is out. The pack is actually quite good; same front row as last week and Cullen and O'Driscoll in the second row have the potential to be immense. Jennings gets a long awaited first cap at openside and is partnered by Quinlan at 6 and Ferris at 8. Not a bad team at all, in fact I think the backline is a significant improvement on last weeks. Kinda annoyed about Heaslip being dropped and Jackman not getting a start but.. what ya gonna do. Eerie depth to the Irish squad though.. I never realised we had that many quality players.